Not taken by the Nexus 6P? Turned off by the iPhone 6S? A little cool on the Lumia 950 XL? If you remain to be convinced by any of the current handsets then Sharp and Japanese engineer Tomotaka Takahashi have something you might be interested in. It's called RoBoHoN (pronounced "robohoan", a mixture of the Japanese words for "robot" and "phone") and it does everything from make phonecalls to project movies on your living room wall. The underlying idea is to make the phone more personal: like Siri in a physical form. RoBoHoN's makers describe it as "a phone in human shape, a phone that you feel like talking to, a phone that also wants to know you". Or at least a phone that wants to know you until the robot revolution arrives. 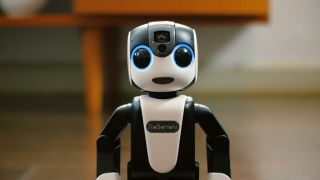 Standing 19.5cm tall (a robot head taller than the iPhone 6S Plus) and weighing 390g (almost three times the Samsung Galaxy S6), RoBoHoN has a 2-inch QVGA screen and can connect to 3G, 4G and Wi-Fi networks. Inside there's a 1.2GHz CPU keeping everything moving... quite literally. It can make calls, send texts and manage your email, as well as respond to your questions and even recognise your face in a crowd. RoBoHoN is able to walk and move independently, so you can send it to the other end of the room to take a photo of you and your friends. A modified version of Android runs the whole show. It's certainly something different if nothing else. The humanoid robot is going on sale in 2016 but at the moment we don't have any details on pricing or international availability.